While some plants are hardy enough to withstand a long winter, others might not fare so well. If you have plants that are removable, now would be an excellent time to relocate them for the winter. Talk to an expert at your local garden store if you are not sure which plants need to be relocated or to where. If you have small water features, such as fountains, you will want to drain them so they don’t freeze and crack over the winter. If you have a large water feature, such as a pond, you will want to clean it out as best as possible. If your water feature has a pump, you will want to be sure to remove the pump before winter. Otherwise, the frozen water will likely break it, causing you to have to replace it in the spring. Once your water feature is all cleaned and ready for winter, you will want to store it if possible. If your water features are small enough to move, you may want to relocate them to a garage or shed. Otherwise, you may want to cover your water features to keep any leaves and animals out. Water features that add beautiful ambiance to your yard in the summer don’t generally fare as well in the winter. Prepare and remove your water features now, before the cold weather hits, and they’ll be ready to add a peaceful and soothing touch to your yard again next spring. Along with water features, our experts can provide services for all of your other home landscape needs, including landscape garden planting, outdoor kitchen landscaping and more. Call us today for more information about water features! (816) 925-0309! Many birds prefer to bathe, rather than swim, so water features shallower than two inches will attract more birds than deep water features. If your fixture is deep, try adding sand or gravel to the bottom for a more favorable depth. You may even vary the depth to accommodate several types of birds. Bowls with smooth ceramic bottoms can be very slippery to birds when wet. Adding sand or gravel to the bottom of a water feature not only helps you control the depth, but it will help provide birds with a better footing as well. Also be sure that the feature is placed securely on the ground or on a low pedestal so there is no risk of it tipping over. Different types of birds prefer different water features, and you have many options beyond the typical bird bath. Mix it up by adding various water features best suited for your needs, including waterfalls, ponds, streams and misters. Think carefully before placing your water features. You want to choose a location that you can see, that provides shade and that offers birds some form of protection nearby. Make sure it is away from disturbances, such as a busy road, pets and doorways, as well. Birds may be beautiful, but they are often messy as well. If your bird bath is busy, it won’t be long until it has quite a bit of poop and features in it. Be sure to clean out your bird bath frequently, using a scrub brush to get off anything that is stuck on. Rinse it with a little bleach, and refill the water often. If you’re looking for ways to incorporate water features into your home or business, our team is ready to help. Along with water features, our experts can provide services for all of your other home landscape needs, including landscape garden planting, outdoor kitchen landscaping and more. One of the easiest water features to maintain, fountains are a popular choice among homeowners. They are portable, cost-effective and–most importantly–relaxing. Popular styles use rocks or ornamental elements. Another great option for people looking to spruce up their outdoor living spaces without a huge commitment, patio ponds are small, portable ponds that can sit on a deck or patio. Patio ponds provide all the relaxation without all the fuss. For homeowners dealing with water restrictions, pondless waterfalls are a fantastic and popular option. These water features cycle water to keep the waterfall going without needing an entire pond. Of course, outdoor water features aren’t limited to just those who want to enjoy the outdoors with low commitment. Many homeowners also love backyard ponds for the relaxation and ambiance they provide, even though they do require more work. While many homeowners enjoy water features for their serenity, water features are also a great way to add some fun into a backyard. Splash pools allow parents and kids alike to get in the water and have a great time. When the kids are in bed and it is time for the grown-ups to have fun, spas are the way to go. These luxurious water features are a great way to spend an evening out in the backyard, and homeowners cannot help but relax in them. Once everyone is relaxed, it is time for fun! Though swimming pools have been around for years, they are still water features that are fantastic for bringing the whole family together for family fun in the sun. Call us today for more information about our innovative water features! (816) 925-0309! Ensuring water quality in your outdoor water feature really isn’t a time-consuming and difficult task. Here are some easy tips to help you keep your outdoor water feature looking fresh! You can add a mechanical filter to your outdoor water feature; it will catch solid waste in a sponge, mat, or brush, and then you remove the waste once it accumulates. A pond skimmer is a simple mechanical filtration tool that you can use to capture waste and improve water quality in your outdoor water feature. Biological filters are most effective when ensuring the water quality of your outdoor water feature. Biological filtration systems provide food and oxygen for nitrosomonas and nitrobacter, two naturally occurring bacteria that make ammonia break down into nitrite and then into nitrate. Fiber matting in the biological filters provide a large surface area for the bacteria to colonize and empty space for nutrient-rich water for flow through and feed the bacteria. Biological filters require less cleaning than mechanical filters, making it easier for you to maintain the water quality in your outdoor water feature. You may have to use chemicals to improve the water quality in your outdoor water feature. These chemicals eliminate algae and many other impurities that can cause your water feature to appear cloudy. Chemicals like Accu-Clear make suspended particles like algae clump and fall to the bottom of the pond, where they can be vacuumed away or removed with a mechanical filter. If you have goldfish or koi in your pond, be sure to use chemicals that are safe for use with fish, or consider an Ultraviolet Sterilizer. If your outdoor water feature suffers from algae problems, you should try an ultraviolet sterilizer to improve water quality. Placing a germicidal UV lamp in a pipe where water passes around it provides a 99% reduction in algae. Even with a UV sterilizer, you need a biological filtration system or the dead algae will not break down. Any other questions about maintaining water quality in your outdoor water feature? Feel free to contact Prestige One Landscaping of Kansas City for more information–call (816) 925-0309! Adding a water feature to your yard can make a big impact on your property. Prestige One Landscaping loves to help Kansas City homeowners turn their yards into calming retreats with custom water feature installations, including ornamental ponds. 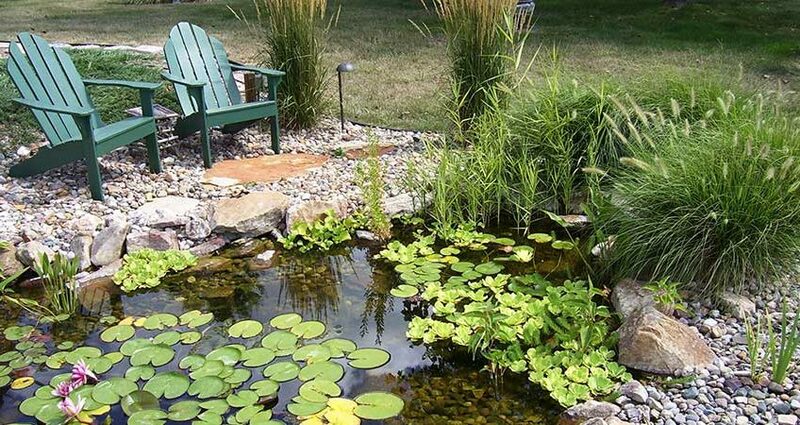 Complete installation of a pond only takes one or two days, but there are some steps you can take as a homeowner to plan ahead to build a pond. Depending on where you live, your city or neighborhood may have specific ordinances you need to follow when you build a pond on your property. You may need a building permit, or you might need a city official to approve your construction plans. Also consider your neighbors to prevent any disputes. A pond dug near your neighbor’s yard can cause shifts in land and water flow. If you build a pond without certification, you can wake up sued by your neighbor for water damage, even if these problems were not caused directly by your pond or the construction process. What's the Best Water Feature for my Outdoor Space? Looking to make your outdoor space just as cozy and inviting as your home? There are several ways to do this, including: outdoor furniture, a covered deck or patio, or even an outdoor kitchen. However, if you’re truly looking to enhance your yard into a vibrant sanctuary, you should consider installing a water feature. Water features are perfect for blocking out the sounds of traffic and the neighborhood while also providing a stunning look. Water features also come in an abundance of shapes and sizes available to met any backyard personality and homeowner’s budget. If you’re looking for something inexpensive and simple, the best way to go is with a prefabricated outdoor fountain. These can be purchased from most hardware stores and garden centers, or online for a wider variety. Most come partially assembled, leaving you with minimal extra work when it comes time to hooking it up. With this option, you’ll have the soothing sounds of a traditional fountain, waterfall or drip system to make your yard more relaxing in no time. For a more personalized and sophisticated fit for your lawn, you should consider installing a custom water feature. These are built to blend in with your landscape and the options are unlimited. 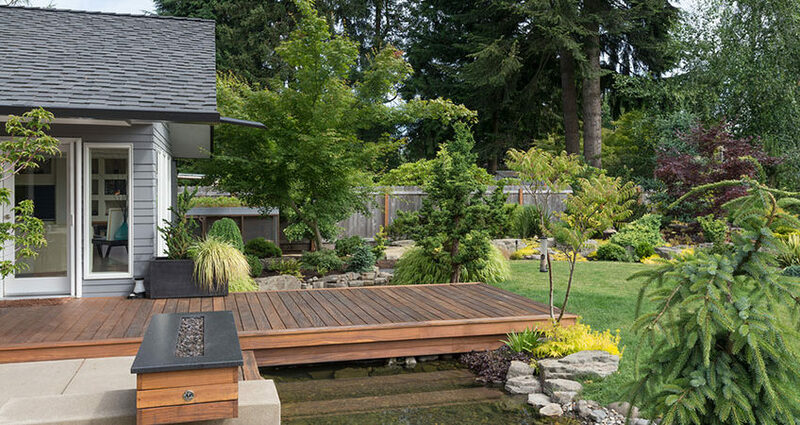 From ponds to large waterfalls, custom water features can perfectly fit your space and style. With your outdoor space, there are no limits. Adding a terraced system of rocks for a waterfall feature or even a lazy river with a bridge to cross can be modern and fashionable. When it comes to your backyard, have fun and wow yourself and your guests. Be sure to choose the right water feature for your outdoor space, for you and your family to enjoy for years. For questions or more information, contact Prestige One Landscaping today. Your workplace may need some life to spark creativity and reduce employee stress. A fountain or water feature might improve your workplace environment. Water displays can help your workplace if used correctly. Running water provides soothing sounds and visual interest. For workers that enjoy this white noise and are inspired by nature, a water feature might improve productivity by reducing stress. The water might distract some workers, so there should be plenty of workplace that is not near the water display. A fountain, inside or outside, can be a great gathering place for employees or visitors. A well placed water feature can attract employees and give them a place to sit, relax, or have a conversation. A waterfall or fountain with benches or seats might be the perfect spot for customers and visitors to enjoy the sounds and sights. Features with moving water can improve the quality of your workplace’s air. Some of the water evaporates as it flows, contributing the the humidity of the air. If your workplace is located in a humid climate, a moving water feature might harm the air quality. Think about your climate and ask for help to choose the best type of water feature for your workplace. You can raise money for your workplace’s dedicated philanthropy with a waterfall or fountain. As visitors and employees toss a coin in for luck, they are contributing to the cause as well. When considering a water feature, you must account for safety. Open pools of water pose risks for children and should be built and installed according to all safety guidelines. Since large fountains are heavy, you’ll want to make sure they are placed in a safe location and won’t strain the floor. Your workplace will benefit when you maintain your water feature to prevent leaks and damage. A water feature can enhance your workplace for visitors and employees. You can learn more about installing the perfect pond, fountain, or waterfall by giving us a call!